Twitter user Otakumi makes Japanese sweets or "wagashi" (和菓子). Traditionally, they are served with tea and are inspired by nature or animals motifs. 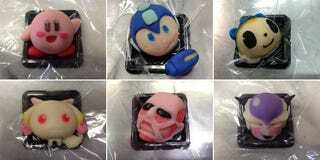 These sweets, however, are inspired by anime and video games. Artisans make an array of shapes—however, anime and video game characters are rather unique! You can follow Otakumi on Twitter or, if you are in Tokushima, visit Kuramoto Hinode. If you are interested in making these sweets, try this recipe.